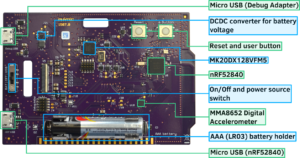 During the February 2018 Embedded World conference in Germany, we started toying with the idea of producing a custom Zephyr development board to highlight some of the main features of the project. We were inspired by badge boards with an electronic ink display worn on lanyards by employees of PHYTEC Messtechnik GmbH, regular contributors to the Zephyr project in areas including USB, 802.15.4, and Bluetooth. After the show closed its doors and everyone else was busy dismantling their show booths, Zephyr team members gathered at PHYTEC’s booth. We started brainstorming details for a board that would be produced and sponsored by PHYTEC specifically for Zephyr developers. Deciding the SoC was easy enough. We picked the Nordic nRF52840 since Bluetooth and 802.15.4 support was natively available in Zephyr. We discussed further details such as sensors, buttons, battery, and form factor. Thanks to the vast expertise PHYTEC has in this area, and their demonstrated experience producing boards in this badge form factor, it was just a matter of getting approvals and agreement on the final details. Five months later, and after further design and implementation discussions, we can happily announce a successful first production run of the board. The reel board is an evaluation board developed by PHYTEC Messtechnik GmbH in cooperation with the Zephyr Project for the Zephyr Hackathon – “Get Connected”, taking place during the OpenIOT summit in Edinburgh, Thursday, October 25. The reel board goes beyond a simple evaluation board with environmental sensors and buttons. It is also equipped with an Electrophoretic (electronic ink) display, Bluetooth connectivity, and a built-in debug adapter based on the DAPLink firmware and NXP MK20DX128VFM5 SoC. Basic support for the board is included in the Zephyr 1.13 release planned for early September 2018. Additional documentation and details and can be found in the Zephyr reel board documentation. Many thanks to PHYTEC Messtechnik GmbH for supporting the Zephyr project and making the reel board a reality.